In the mid-to-late 00s, Boys Like Girls have piggybacked onto the pop-emo scene trail-blazed by bands like the (more talented) All-American Rejects. Their genre, emo, has now almost completely abandoned its intense, uncompromising Rites of Spring roots, now coming to rest somewhere in that spectrum between Jimmy Eat World/Sunny Day Real Estate and Fall Out Boy, with an eye turned ever towards mainstream acceptance. Exhibiting the full range of the emo spectrum is BLG, whose self-titled debut proved that there was a healthy market for this music, one likely appealing mostly to teenage girls. A fair number of them ate up the predictably over-the-top emotions expressed on said album, which featured a couple of sharp, exhilarating tracks that did lift off (“The Great Escape” and “Five Minutes to Midnight”), but which sank without a trace by the end. 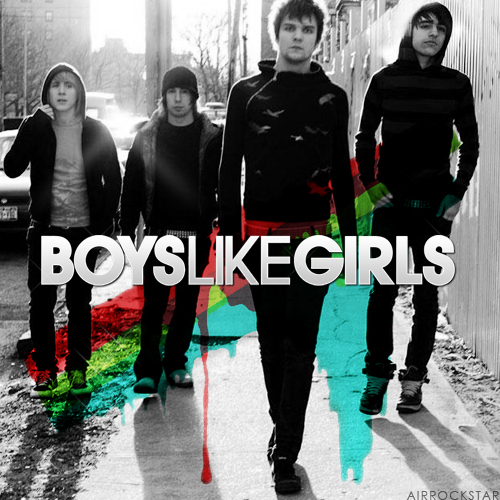 A 12-song work that should have been shorter, Boys Like Girls, at its nadir, exemplifies the worst traits of this kind of schmaltzy pop-rock. The lyrics promote the immature, woe-is-me attitude—“Who said it’s better to have loved and lost? / I wish that I had never loved at all,” etc—that, somehow, people still find poignant. When the melodies fade away, there’s not much left in the songs’ originality or sturdiness to make up for it, and lead singer Martin Johnson’s voice just gets thinner and thinner. The aforementioned two opening tracks, plus a couple more (“Thunder”), are worth downloading, but that’s about it. All of which makes their sophomore release, 2009’s Love Drunk, that much more surprising. This is a massive step forward, albeit without a significant sonic shift. Indeed, this represents the good end of the spectrum, projecting the best feelings of emo-pop. This is what they should always strive for, that kind of loud, hyper-melodic, blood-pumping, slightly-embarrassing-but-enjoyably-campy music that’s best belted out loudly from the car. By now, BLG became undeniably fun-they had found the right tone, and they had found the gift of melody. When they sing “We’re heading for a heart, heart, heartbreak” or “I used to be love drunk, but now I’m hungover” or “I wish that I could turn this car around, but she’s got a boyfriend now,” they sound carefree instead of overly caring, delighted rather than despondent, loose rather than lost. And THAT is the critical distinction—and the philosophical bent that really makes the album work. Self-misery would have sunk this project—and it wouldn’t have fit with the music—but the freewheeling, uplifting thoughts blend together perfectly with the anthemic choruses to actually improve your mood. And no one’s more surprised than me; when I saw some of these song titles (like “She’s Got a Boyfriend Now”) I dreaded some Pinkerton or Narrow Stairs-esque ‘I’m-not-worthy’ lyrics; instead, BLG treat such situations as opportunities for freedom and novelty. And they marry such sentiments to songs whose ability to withstand repeated playings, I’ll be honest, stunned me. Thanks to the playfulness and energy, the vastly improved hooks, and the fact that the songs are now drenched in color rather than projecting the same relatively bland hue, they’re able to stir up that feeling of grand romanticism to which many similar bands only aspire. Despite re-using some elements (start-stop basslines, falsettos), their previously-dormant sense of songcraft results in new peaks: tacks like the opener and “Chemicals Collide” are as good of stress-relievers as I’ve heard. So, on some level, Love Drunk is what it is, but on another level, it’s better than that. Snobs will hate this kind of music on principle, and that’s fine, but, like film’s romantic comedies, it can be good or bad depending on its execution. Their career has proved that. Your appreciation will probably be highly dependent upon your level of approval with their musical philosophy. But if you’re OK with it–and you’ve already exhausted the four All-American Rejects albums–give them a try.